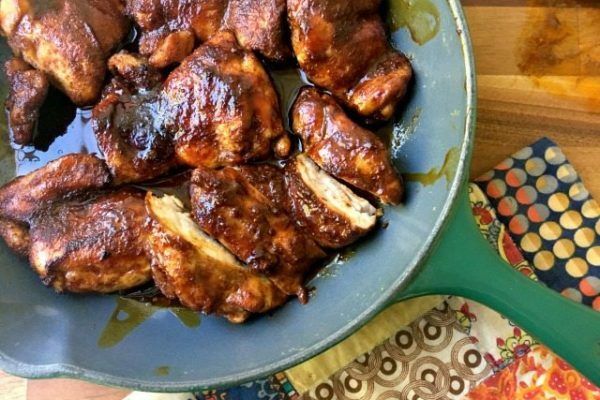 This chicken recipe is even more delicious if you have time to let it marinate. And the marinade keeps well in the fridge so you could mix up a double batch. 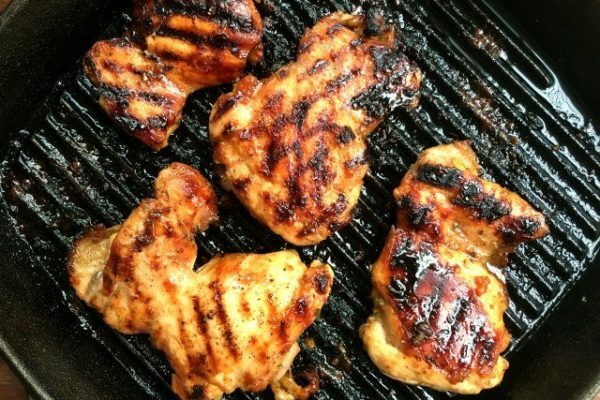 Mexican Molasses Lime Grilled Chicken recipe is an easy chicken dish with pizazz. It’s still summer and I’m on vacation but school supplies lists keep appearing on the table in front of me. According to the list, my daughter needs 50 pencils and 800 sheets of loose leaf (among other things). Next week she’ll march off to school looking like she’s headed on a week-long back country hike, her knapsack bulging with all those school supplies and boxes of Kleenex and indoor sneakers. My son will leave for school with a pen, a wad of paper and hopefully his lunch. As much as I hate to see summer vacation coming to an end I do love the first day of school, watching my kids head out the door. It’s as though, right before my eyes they grow from first graders to the middle school and high school students they are today, the reverse of Tom Hanks becoming a boy again at the end of the movie “Big”.  But school hasn’t started yet and the holiday weekend awaits so I’m sharing a recipe that you can enjoy at your Labour Day barbecue. 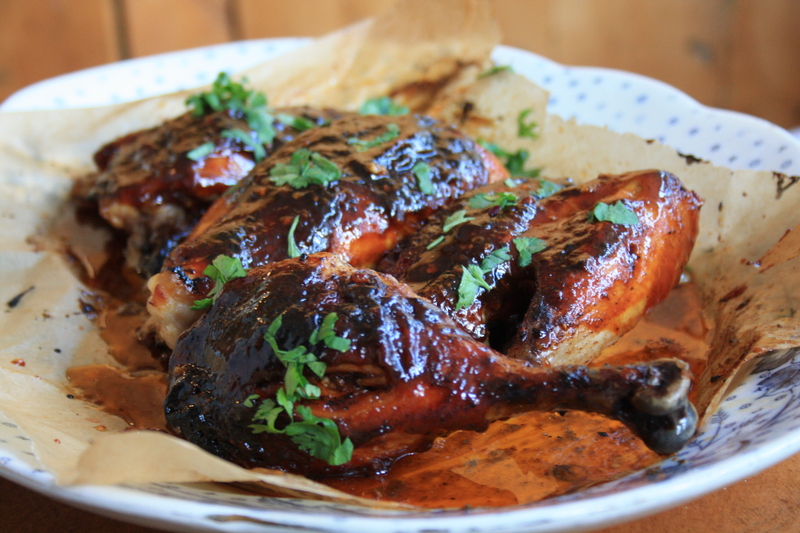 Mexican Molasses Lime Grilled Chicken recipe is an easy chicken dish with pizazz. 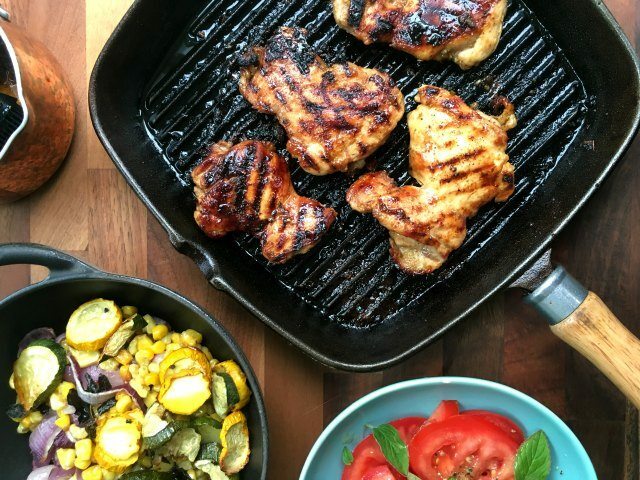 It’s perfect for your weekend barbecue but is quick enough for a weeknight. 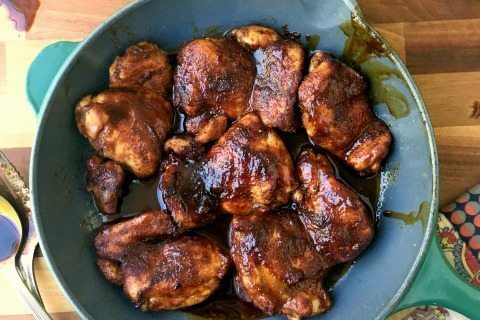 The recipe uses boneless, skinless chicken thighs, which I find are more moist and flavourful than chicken breasts, and cheaper too. I serve it with roasted corn and summer squash (zucchini). 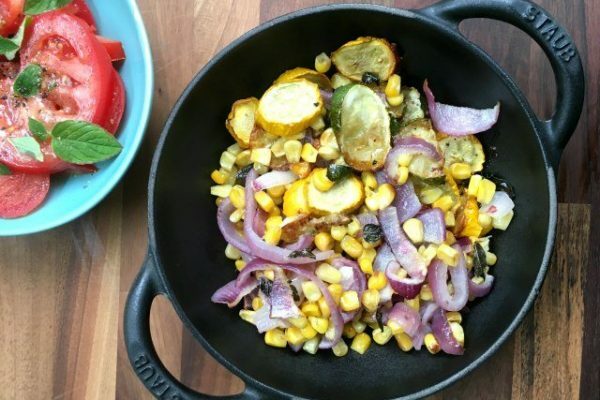 Just toss 1 1/2 cups of frozen corn with two chopped summer squash, one sliced red onion, a clove of garlic, minced, 1 Tbsp. of olive oil, salt & pepper and whatever herbs you have on hand. Roast at 375 F until the zucchini is tender. Stir from time to time so it cooks evenly. Instead of roasting the vegetable mixture you could saute the mixture in a large frying pan. Marinated Tomato Salad with Garlicky Paprika Vinaigrette would be another great addition to the meal. Serve Molasses Crinkle Cookie S’Mores for dessert. Combine all marinade ingredients in a sauce pan and stir well. Pour 3 Tbsp. into a zip-lock bag or baking dish and add chicken. Toss the chicken until it’s well coated. Marinate for 30 minutes (if you have time) or up to 12 hours. Bring remaining marinade to a simmer over medium heat and cook until reduced by half. Season chicken with salt and pepper. 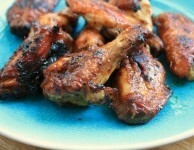 Grill over medium heat (either stovetop or barbecue) until cooked through, basting often with the remaining marinade. Tent chicken with foil and let rest for 5 minutes before serving. 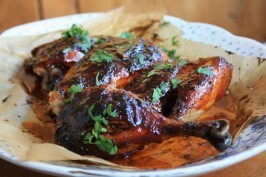 An easy chicken recipe that’s a favourite with my kids. It can be made ahead of time and reheated. 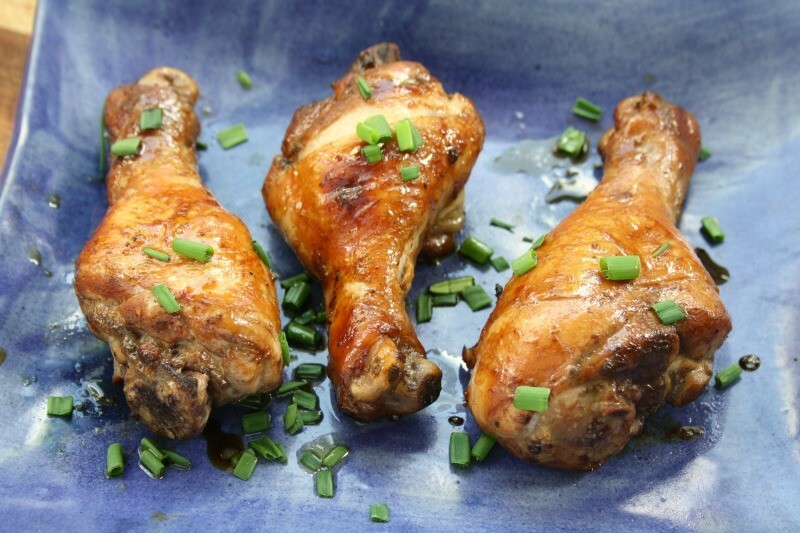 When I tell my kids we’re having chicken for supper they groan, except when I tell them we’re having Sweet and Sour Chicken Drumsticks. In their minds it’s the next best thing to having wings for supper. 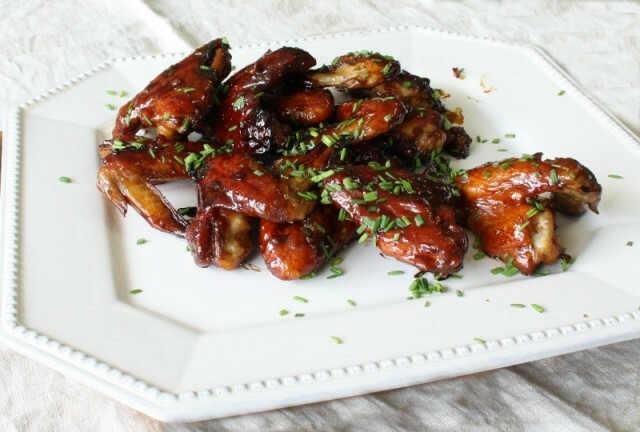 And there is a little something about this recipe that reminds me of wings, especially if you bake the drumsticks longer and they get a little sticky. This recipe is extra easy to put together. 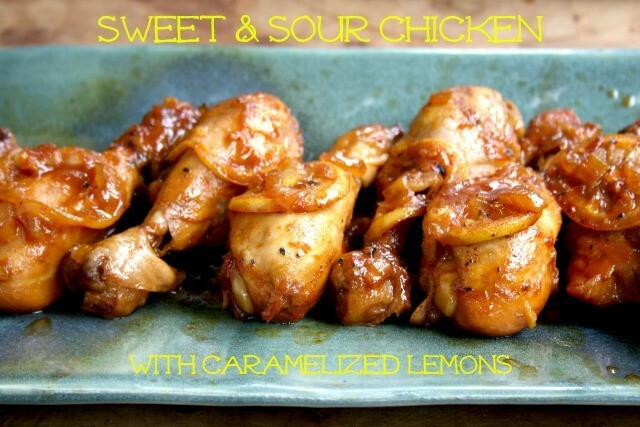 The sliced lemon adds a little zing to the sauce and the lemons caramelize nicely so can be eaten along with the chicken. 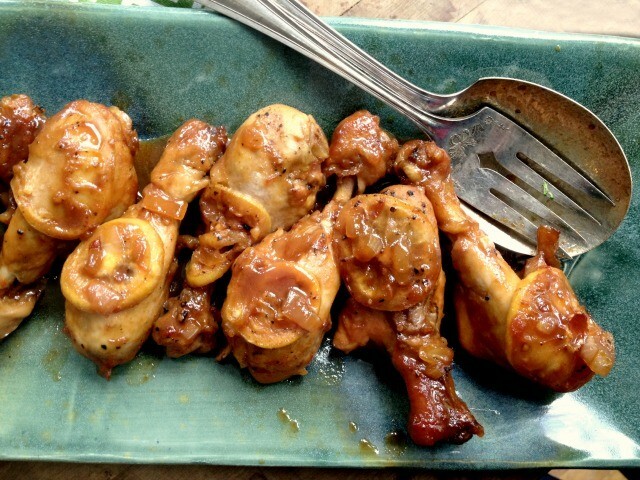 This method of cooking is ideal for chicken drumsticks since braising them in the flavourful sauce makes the meat extra tender. The recipe works well with chicken thighs too. 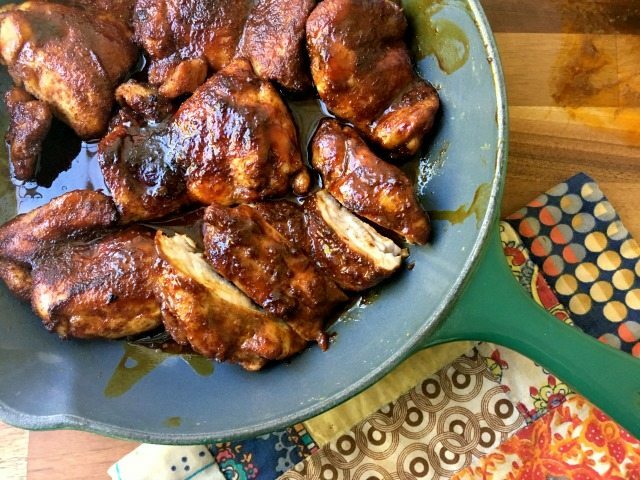 If you have made our Oven Baked Spareribs recipe you’ll see that I have used the same delicious sauce recipe. This recipe can be baked ahead of time (like the night before), refrigerated (sauce and all) and then reheated. 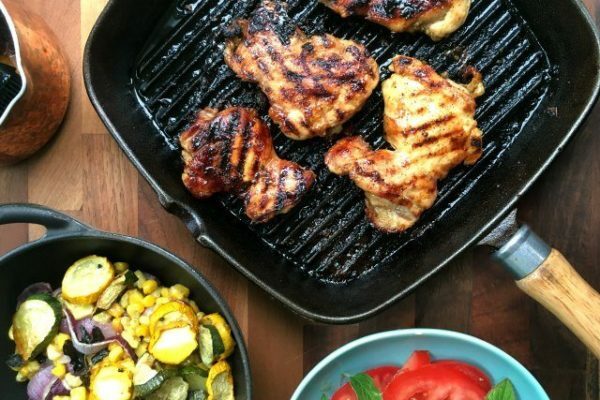 You can finish this recipe on the barbecue for a bit of smoky flavour (5-10 minutes on the grill). Make a double batch of the sauce so you have it on hand for next time. Look for thin-skinned lemons and slice them as thinly as possible. Sprinkle with salt and pepper and dress with lemon slices and sprinkle over the onions. In a medium bowl whisk the chili sauce, mustard powder, brown sugar, molasses, orange juice and lemon juice. Pour half of the mixture over the chicken, cover and bake for 30 minutes, basting once with another spoonful of the sauce. Remove lid and continue to bake for another 30-45 minutes, or until meat is tender. Baste them a few times with remaining sauce and pan sauces. (Bake them longer if you want them a little sticky). 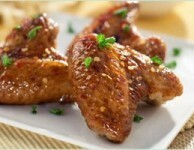 Spicy Molasses Wings are extra easy to make. I have been teaching my kids to cook. Not complicated stuff, but lots of the basics: cookies, pizza (including the homemade dough), brownies, muffins, cakes. 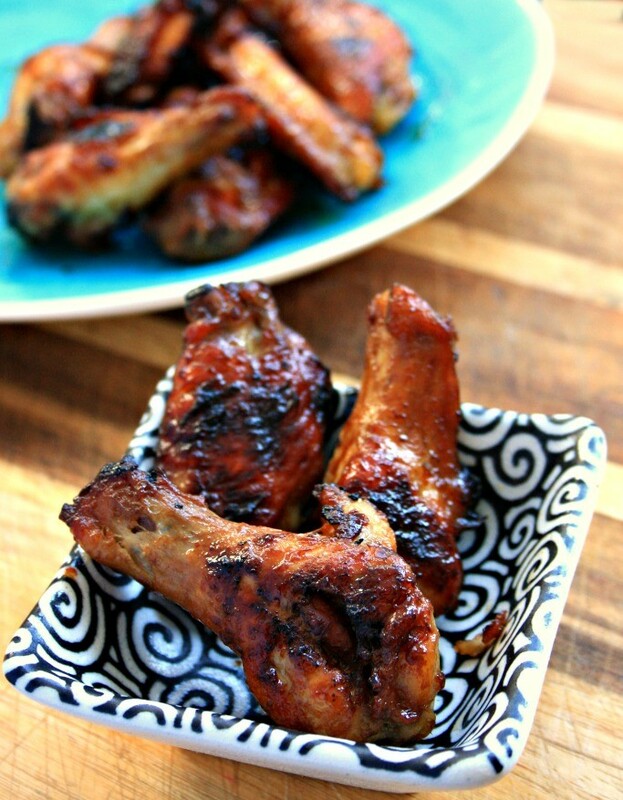 They’re constantly asking for wings so this recipe for spicy molasses wings is their new task. 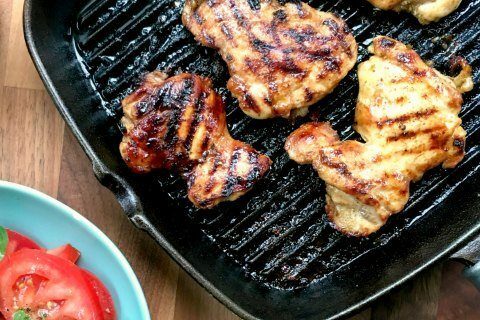 It’s easy — the marinade has barely a handful of ingredients and the wings cook without much fuss. I remember learning to cook alongside my mom, licking the bowl and the beaters mostly. My first cake, after I moved on from the Easy-Bake Oven, was a Jello cake. Then I moved onto cheese-and-bacon-things, Kraft pizzas and zucchini casserole. I made wings for the first time last winter and that’s what got my kids hooked on them. This recipe is simple enough for my kids to make on their own. 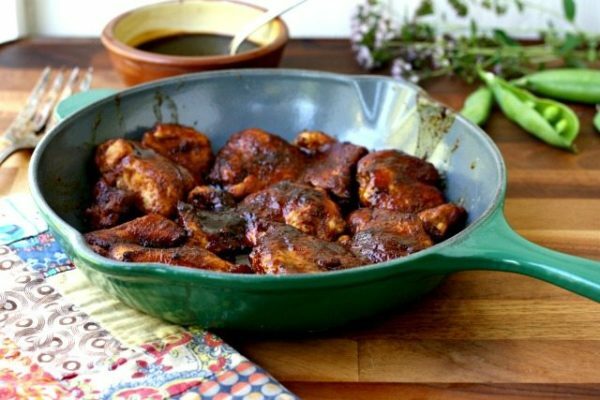 In a large bowl combine marinade ingredients (first 5 ingredients). Add the chicken and let marinate in the fridge, covered, for 30 minutes to overnight. 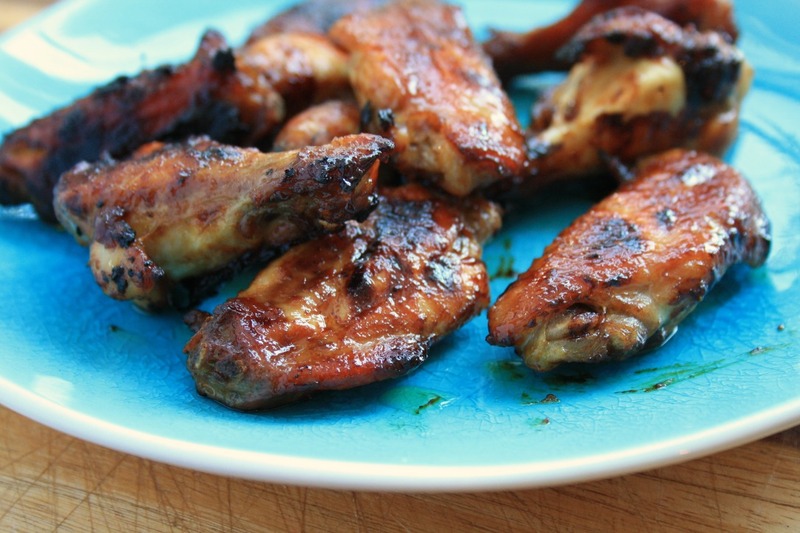 Preheat oven to 400 F. Spread wings in a single layer on a parchment-lined baking sheet (one with a rim). Bake for 15 minutes, remove from oven and flip. Return to oven for another 10-15 minutes. To finish, broil for 5 minutes and flip. Broil another 5 minutes. Remove from oven, transfer to a plate and sprinkle with chopped chives. Nothing I have ever cooked has made my kids more excited. Nothing. So I figure I might as well use this to my advantage. Vacuuming needs to be done before you can eat the wings. The bathroom needs to be cleaned before you can eat the wings. Have you made your beds? This is a near effortless recipe that offers easy substitutions for ingredients that you might not have on hand. No Hoisin sauce? 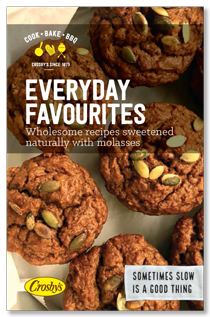 Add an extra tablespoon of molasses instead. No rice vinegar? Any vinegar will do, especially cider vinegar. Dried ginger can be used in place of fresh. Ditto for garlic. 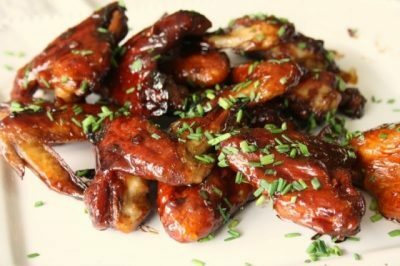 Omit the hoisin (replace with molasses) and substitute tamari for soy sauce if you want to make these Asian Wings gluten free. These have become a Friday night favourite in our house, an easy appetizer while I putter away making supper in that not-rushed-Friday sort of way. 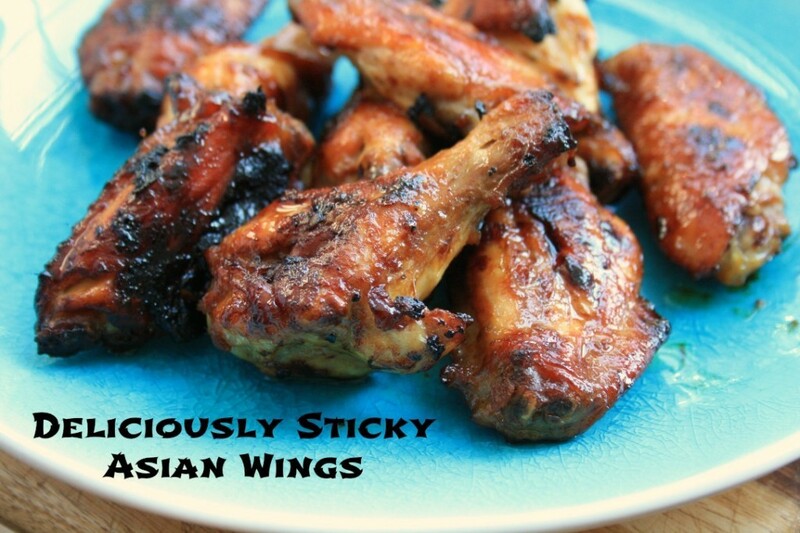 Asian Wings are fall-off-the-bone moist and pleasantly sticky. You’ll want to lick your fingers while you eat them. Guaranteed. Combine all ingredients, except wings. Toss wings with mixture. Spread in a single layer on a parchment lined cookie sheet. (Or a well-oiled cookie sheet). Bake at 450 F for 25 minutes, flipping half way through.